people stopped and watched. Some even bought! 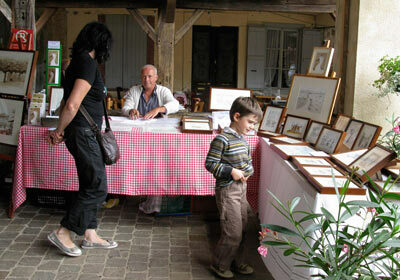 Perry was invited to take part in an art fair in Bassoues, a pretty medieval village in the Gers, close to Marciac. It was a Sunday during the jazz in Marciac festival, so there were a lot of tourists about. Perry made a few drawings of Bassoues and the big café. The owner of the café saw the large original - that had been strategically placed near his terrace- and bought it immediately. The cartoons had people laughing and there was a constant stream of enthusiastic buyers all day. All in all, a good sign for future markets. We've already been invited for next year. Perry was due to go spend a long weekend in London with his brother Paul, but Paul moved to Cornwall in the meantime, which complicated matters. So Perry decided to delay his visit and go see the whole family who were gathering for a few birthdays in August. 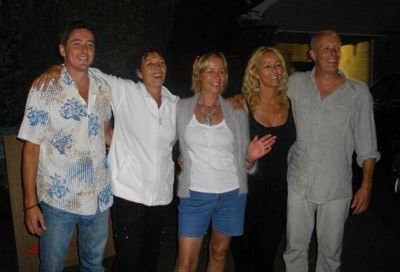 Arriving in time for a huge fish and chips dinner for 25 in a tent in the garden, The Taylor clan were soon in full swing. The week included kayaking on the sea, beach walks, barbecues, Cornish ice cream, Cornish beer, pig roasts, fights, tears, hugs and laughter. Nothing changes! Still, a good time was had by all and Perry's parents needed a few days rest after everyone had gone. In the meantime, Caroline's parents had called and decided on the spur of the moment to come spend some days with their only daughter while Perry was away. A more sedate affair, they enjoyed the peace, walks, DIY and reading in the sun. The lawnmower tractor was in need of a service. The blades weren't as sharp as they could be and so we asked M Toulouse to come get it. Christian is a real nice guy and has a soft spot for Caroline. The two of them spend all the time taking the mickey out of each other. The next day it was back and in great running order. Caroline got on and drove off. For about ten metres, then CRANG!! 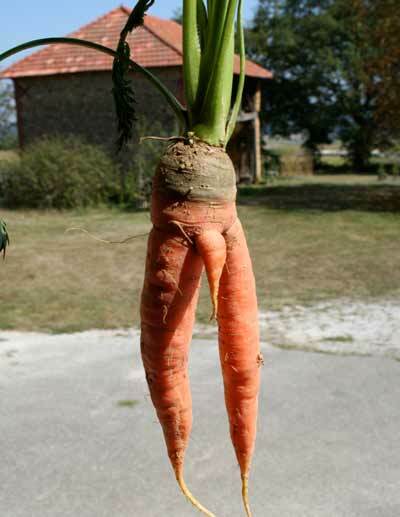 CLONK, CLONK, CLONK... Even Perry heard it from his studio in the back of the house. It was quickly clear that she had hit something very hard and the blades had been knocked out of sync and thus hitting each other as they span. 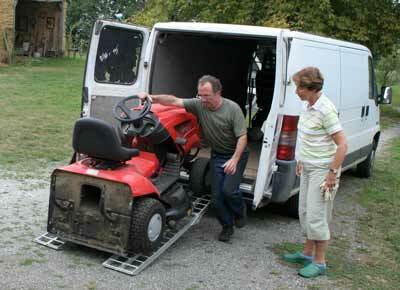 Perry drove down to Trie, borrowed Christian's van and took the tractor back down. An expensive prang, the replacement belt and straightening of the blades cost € 90. We're very careful now to walk through the long grass and sift out the obstacles, tiles, and rocks. 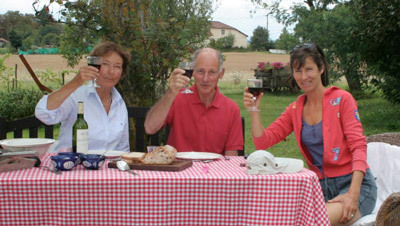 Trie-sur-Baïse was 'en fête' in the second week of August. Perry went down to help behind the bar of the night market and serve food to more than 650 people. The rugby club always provides a team of people to cook, cut, barbecue, serve and clear up for the two night markets and dinners. They eventually cleared the bar at 5 am and Perry was back down there again at 10 am to help finish clearing up. 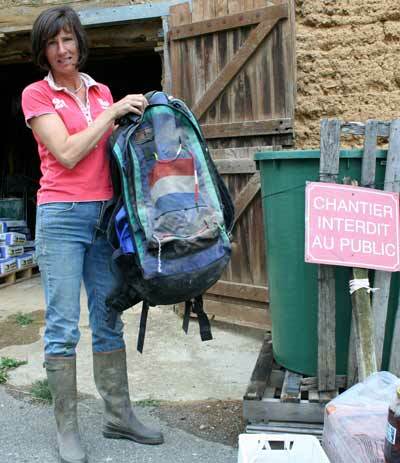 Meanwhile, Puydarrieux was preparing for its own fête in September. As a member of the comité des fêtes, Perry volunteered to design the fête T-shirt. 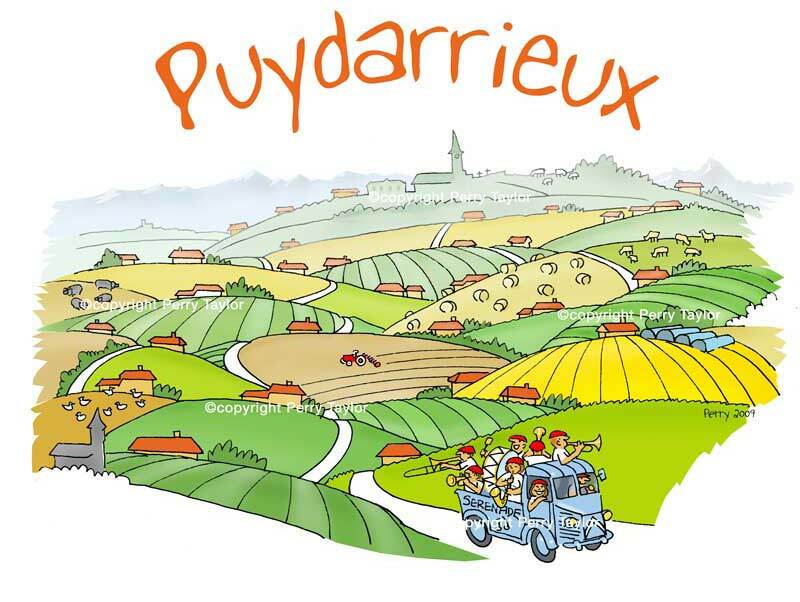 The result was a colourful cartoon of Puydarrieux with the Pyrenees in the background. A few eeks later it was adorning the backs of the Comité as they went about their duties.